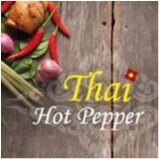 Thai Hot Pepper joined our Mission to help provide access to “Clean Water for All by 2030”. This Mission was initiated by the United Nations. A big thank you to Thai Hot Pepper’s team and customers for joining this extremely important mission on 04 December 2017. "A really cute Thai restaurant with great dishes at great prices. Really good seating that has enough room and not too noisy as well. The service is really good and it's also a great place for people watching with huge windows onto King street."